There are a number of reasons you might want to keep a list of recent search queries on your smartphone. Then again, just because you were looking up the rules of hockey yesterday doesn’t mean you want to see related searches today. 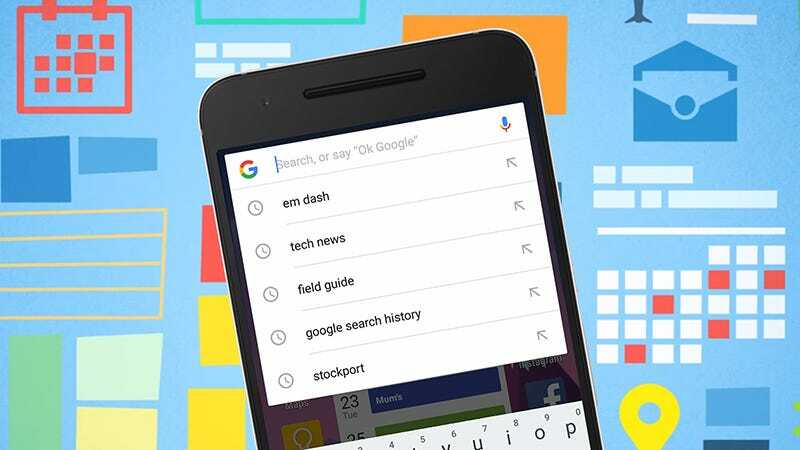 If you’re using Android, you can erase all recent mobile searches with a quick shortcut. Tap once inside the ubiquitous Google search box at the top of the home screen and some of your recent queries appear. Tap and hold on any suggested search and you get the option to remove it. Please note: this affects your Google history as a whole, so the suggested search will no longer appear on the desktop or any other Google portal either. If you’re happy to let it go, tap Delete. For a more detailed look at your search history, and just about everything else Google is logging about your activities, go to your account page. You can also turn it off completely on mobile by opening the Google app then choosing Settings, Accounts & privacy, Google activity controls and then Web & App activity.